A little over a year after it disappeared, Argentina's navy has announced that searchers have located a submarine that went missing with 44 crewmen aboard. The TR-1700 class sub ARA San Juan was detected at a depth of 800 metres in the Atlantic Ocean, off the Valdes Peninsulain Argentine Patagonia, on Saturday. The vessel disappeared on November 15 last year and extensive missions to locate it have been under way since, with help from the international community. Until now, the sub's fate was unknown due to its diversion from a routine mission just before it disappeared. But officials confirmed today hat a remote-operated submersible from the American ship Ocean Infinity, which was hired for the latest search effort, has found the submarine. A "positive identification" has since been carried out, the navy said. 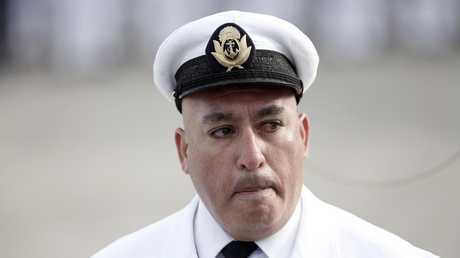 The news comes just days after families of the missing submariners held commemorative services in Argentina to mark one year since the submarine vanished. 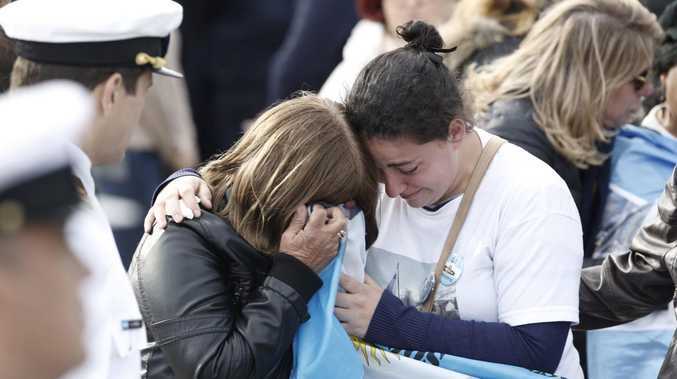 There were emotional scenes at a navy base at Mar del Plata - the lost vessel's intended destination 12 months ago - as officials gathered with loves ones to mourn. With the sub at a spot so deep in the ocean, it could be impossible to ever know what happened to it. However, in an interview with news.com.au last year, naval analyst James Goldrick, a former senior officer and leader of the Australian Defence Force Academy, speculated that something more than a communications failure prevented it from surfacing. The sub was built in 1983, just after the Falklands War and Argentina's navy has very little money and a fleet of just three submarines, but it has "been hanging on to its subs by its fingernails", Mr Goldrick said. Submarines usually have indicator buoys that appear at the surface if a sub goes down, but with the vessel being so old, it's not know what its capabilities were. The fleet was modernised between 2007 and 2014 to extend its use by about 30 years, but Argentina has been plagued by economic problems since the Falklands War. If a compartment of the submarine has caught fire or flooded, "it gets very tricky to survive", Mr Goldrick said. Wild rumours have swirled in the past several months, including that the vessel was being chased by the British and Chilean military around the time of its disappearance. The sister of a sailor on bord released messages received in the days prior that spoke of "a lot of movement" in what was meant to be a routine mission. "It was that weird message in which he told us he was looking for a British helicopter and a Chilean ship, but unfortunately we did not continue with that conversation, he stayed there. That was the last message," Jessica Medina said. In his messages, the sister said her brother told her the ARA San Juan was sailing close to the Falklands - referred to as Malvinas by Argentina - on November 3.